Anuradhapura, one of the ancient capitals of Sri Lanka, has earned fame for its well-preserved ruins of ancient Lankan civilization. The city lies 205 km north of the capital Colombo in Sri Lanka's North Central Province, on the banks of the historic Malvathu Oya. UNESCO designated the Sacred City of Anuradhapura a World Heritage Site in 1982. Founded in the fourth century B.C.E., Anuradhapura served as of the capital of the Anuradhapura Kingdom until the beginning of the eleventh century C.E. During that period, the city enjoyed stability constituting one of the most durable centers of political power and urban life in South Asia. Considered sacred to the Buddhist world, monasteries covering an area of over sixteen square miles (40 km²) surround the ancient city. 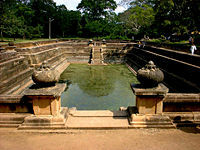 Anuradhapura has significance in Hindu legend as the fabled capital of the Asura King Ravana in the Ramayana. Anuradhapura stands out as a major force in the development and advancement of Buddhism in South East Asia. The UNESCO designation names the site the "Sacred City of Anuradhapura" to acknowledge its sacred function. 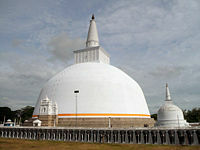 Anuradhapura hosted both Hindu and Buddhist holy people and congregations. Buddhist monasteries covering over sixteen square miles surrounded the city. In the early period of the city's history (500 B.C.E. to 250 B.C.E. ), Hindu ascetics founded hermitages while the king Matasiva built monasteries for wandering mendicant Buddhist monks. Buddhism became the primary force in creating the civilization of the Anuradhapura Kingdom from 250 B.C.E. to 210 B.C.E., the political system including the kingship followed Buddhist lines, during the kingship of Devanam piya Tissa, a contemporary of Emperor Ashoka who played a monumental role in promoting Buddhism in northern India. Evidence of the importance of Hinduism and Buddhism in Anuradhapura lay in the sacred buildings that remain to this day, including gigantic temples (for example, Jetavanaramaya dagoba the tallest brick structure in the world) and expansive monasteries (including the Maha Vihara and the Abhayagiri Monasteries). Since restoration of the sacred sites in Anuradhapura, the city has again become a much visited pilgrimage center. Excavations in Anuradhapura have uncovered information about the existence of a protohistoric habitation of humans in the citadel. The protohistoric Iron Age which spans from 900 - 600 B.C.E., marked the appearance of iron technology, pottery, the horse, domestic cattle and paddy cultivation. In the time period 700 -600 B.C.E. the settlement in Anuradhapura had grown over an area of at least 50 ha. Irrigable and fertile land surround the city, strategically situated with major ports northwest and northeast. The city benefited from dense jungle surroundings, providing a natural defense from invaders. The Lower Early Historic period, spanning from 500 to 250 B.C.E., has been studied by way of chronicles. During that time, King Pandukabhaya formally planned the city with gates and quarters for traders. The city at the time covered an area of one square kilometer, one of the largest cities on the continent at the time. He laid out four suburbs as well as the Abhaya-tank, the common cemetery, the place of execution, and the chapel of the Queens of the West, the banyan-tree of Vessavana and the Palmyra-palm of the Demon of Maladies, the ground set apart for the Yonas and the house of the Great Sacrifice; all these he laid out near the west gate. A hermitage was made for many ascetics; eastward of that same cemetery the ruler built a house for the nigantha Jotiya.(...) On the further side of Jotiya's house and on this side of the Gamani tank he likewise built a monastery for wandering mendicant monks, and a dwelling for the ajivakas and a residence for the brahmans, and in this place and that he built a lying-in shelter and a hall for those recovering from sickness. King Pandukabhaya made Anuradhapura his capital in the fourth century B.C.E., laying out the town and its suburbs according to a well organized plan. He constructed a reservoir named Abhayavapi. He established shrines for yakkhas such as Kalawela and Cittaraja. He housed the Yaksini-Cetiya in the form of a mare within the royal precincts and made offerings to all those demi-gods every year. He chose the sites for the cemetery and for the place of execution, the Chapel of the Western Queen, the Pacchimarajini, the Vessavana Banyan Tree, the Palm of the Vyadhadeva, the Yona Quarter and the House of the Great Sacrifice. The slaves or Candalas received duty assignments, having a village set apart for them. They build dwellings for Niganthas, for wandering ascetics, for Ajivakas and Brahmanas. He established the village boundaries. The administrative and sanitary provisions for the city and the shrines indicate that over the years the city developed according to an original master plan. His son, Mutasiva, succeeded to the throne. During his reign of sixty years, Matasiva maintained Anuradhapura as the capital and laid out the Mahameghavana Garden which played an important role in the early history of Buddhism in Sri Lanka. During the reign of his son Devanam piya Tissa, who followed him, Buddhism appeared in Sri Lanka, 236 years after the passing away of the Buddha. Emperor Ashoka in India had been a contemporary of Devanam piya Tissa. The period extended from 250 to 210 B.C.E. During that period, a kingship began and a civilization developed based on Buddhism. Legend places the capital of the Rakshasa King Ravana in the Hindu epic Ramayana (The Epic of Lord Rama) in Anuradhapura. Legend depicts Rama devotee Lord Hanuman burning the capital before the epic war. A popular legend among the Hindus contents that anyone digging anywhere in Anuradhapura will find a layer of ash from that fire. With the introduction of Buddhism, the city gained prominence and the great building era began. The Mahavamsa states that King Kutakannatissa built the first city wall to a height of seven cubits with a moat in front of the wall. King Vasabha further enlarged that fortification by raising the wall a further 11 cubits to 18 cubits. The king also added fortified gatehouses at the entrances, the ruins of which still remain. The Mahavamsa also states that the city founders consulted soothsayers and architects while planning the city construction. The Golden Age of Building marked the period of building vast monastery complexes, among them some of the tallest buildings in the ancient world. 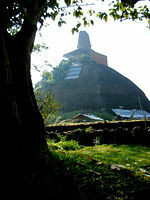 The Jetavanaramaya dagoba of the city still reigns as the tallest brick structure in the world. The Maha Vihara, founded by King Devanampiya Tissa in 249 B.C.E., centered around the orthodox Theravadins. The heterdox Mahayanists founded the Abhayagiri Vihara. King Mahasena (275-310 B.C.E.) built the Jetavanaramaya located in between the Maha Vihara and the Abhayagiri Monasteries. In the suburbs of the city Buddhists constructed major monasteries with their gigantic stupas including the Maha Thupa, the Bodhi Tree and Thuparama of the Maha Vihara stood to the south of the city. The Abhayagiri to the north, the Pubbarama to the east, the Tanovana to the north-west and the Jetavanaramaya to the south-east. During the reign of King Kirtisri Meghavana, monks brought the Sacred Tooth Relic to the city, enshrining it in Dhammacakka. Annually monks carry the relic carried in a procession to the Abhayagiri monastery for exhibition. Emperor Ashoka's daughter, the Princess Sangamitta, planted the Bodhi tree as a cutting brought from India around 236 B.C.E. Guardians have kept uninterrupted watch over the tree ever since. The city's popularity grew both as a religious center and as the administrative center, attracting a large population to the city for permanent settlement. Thus the dwellings improved to accommodate the expanding population. King Vasabha constructed many ponds, fed by a network of subterranean channels, to supply water to the city. Engineers built the Tissa and Abhayavapi tanks, the Nuwara weva, and dammed the Malwatu Oya to build the 4408 acres (17.84 km²) Nachchaduwa wewa reservoir. Planners created parks in the city for royalty and the public. For example, the Ranmasu Uyana below the bund of Tissavapi or Tisa weva strictly reserved for the members of the royal family. The city's rulers constructed large lakes to irrigate paddy lands and also to supply water to the city. Nuwara wewa and Tissa wewa number among the best known lakes in the city. The history of medical care began early, for in the fourth century B.C.E. 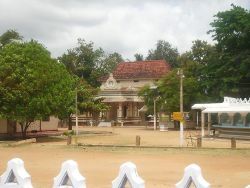 King Pandukhabaya, in the course of sanitizing the town, constructed a hospital. Authorities paid attention to health care and education, building several hospitals in the city. King Buddhadasa (337-365 C.E. ), himself a physician of great repute, appointed a physician in charge of every ten villages. For the maintenance of those physicians, he earmarked one-tenth of the income from the fields. He also set up refuges for the sick in every village. King Buddhadasa had physicians appointed to look after the animals. In the forth century C.E., King Upatissa II provided quarters and homes for the crippled and the blind. A large workforce had been employed keeping the city clean. Kassapa V (914-923 C.E.) founded a hospital close to the southern gate of Anuradhapura. General Sena in the tenth century built a hospital close to the ceremonial street (Managala Veediya). Anuradhapura attained magnificence about the commencement of the Christian era, ranking beside Nineveh and Babylon in its colossal proportions—its four walls, each 16 miles (26 km) long, enclosing an area of 256 square miles (663 km²) —in the number of its inhabitants, and the splendor of its shrines and public edifices. The city also had some of the most complex irrigation systems of the ancient world. Situated in the dry zone of the country the administration built many tanks to irrigate the land. Most of those tanks still survive. Some of those tanks may be the oldest surviving reservoirs in the world. The city suffered much during the earlier South Indian invasions, finally abandoned by 1017 C.E. The city served as the capital of the country continuously from the fourth century B.C.E. to 1017 C.E. Its decline began with continuous wars with the invading South Indians driving the kingdom into poverty. Chola invasion forces sacked the city in 1017, forcing the rulers to move the governing capital to the relative safety of Polonnaruwa. The city sat in ruin and neglect until the nineteenth century when the British rediscovered the site. They cleared the jungle, laying the ruins bare. A measure of prosperity returned to the surrounding country by the restoration of hundreds of village tanks by the British. The ruins consist of three classes of buildings: dagobas, monastic buildings, and pokunas. The dagobas, bell-shaped masses of masonry, vary from a few feet to over 1100 ft (340 m) in circumference. Some of them contain enough masonry to build a town for twenty-five thousand inhabitants. Remains of the monastic buildings lay in every direction in the shape of raised stone platforms, foundations, and stone pillars. The Brazen Palace, erected by King Dutugamunu about 164 B.C.E., constitutes the most famous. The pokunas, bathing-tanks or tanks for the supply of drinking water, lay scattered throughout the jungle. The city also contains a sacred Bo-Tree, dating to the year 245 B.C.E. The government extended the railway from Kurunegala to Anuradhapura in 1905. Eight places of veneration have been designated in Anuradhapura (Atamasthana). They include: Sri Maha Bodhiya, Ruwanwelisaya, Thuparamaya, Lovamahapaya, Abhayagiri Dagaba, Jetavanarama, Mirisaveti Stupa, and Lankarama. Other important structures include: Isurumuniya, Magul Uyana, Vessagiri, Rathna Prasadaya, Queen's Palace, Dakkhina Stupa, Sela Cetiya, Naka Vihara, Kiribath Vehera, Kuttam Pokuna, Samadhi Statue, and Toluwila Statue. Many other ruins throughout the sacred city of Anuradhapura and in the vicinity await identification. Tamil invaders or vandals destroyed many of them. Neither the tourists nor the pilgrims had paid much attention to those ruins, archeological findings have been meager. Although situated outside the sacred city of Anuradhapura, the pilgrims never fail to pay homage to the statue Avukana. ↑ 1.0 1.1 1.2 Wilhelm Geiger Mahānāma and Mabel Haynes Bode, The Mahāvaṃsa Or, The Great Chronicle of Ceylon (Pittsburg, PA: Lakdiva Books, 2002). Retrieved June 30, 2008. Coningham, R. A. E. Anuradhapura Citadel Archaeological Project: Preliminary Results of a Season of Geophysical Survey. South Asian Studies 10: 179-188, 1994. Coningham, R. A. E. The Origins of the Brahmi Script Reconsidered: The New Evidence from Anuradhapura. Minerva 8(2): 27-31, 1995. This page was last modified on 22 November 2016, at 21:03.